My decision to run for FIDE president was made with the hope that we can reform FIDE, to make it more efficient, open and responsive; in other words a better FIDE. Making a positive difference was and still remains my goal. For good governance members of the Board should not remain for more than eight consecutive years. It was in no way an attack against individuals in the current leadership. I put together an experienced team, one that received throughout the campaign a lot of support; from chessplayers, organizers and administrators from all over the world. To all these people, on behalf of my ticket, I would like to say that the spirit of reform-FIDE will continue no matter what the result of the FIDE elections, for the momentum we have gathered will not allow itself to be stopped by the end of the FIDE Congress this coming October. Here is a picture I took of Ignatius Leong in Singapore in 1988. 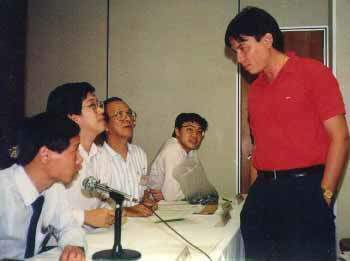 Grandmaster Eugenio Torre is standing in the red shirt. Leong is to the far left and leaning forward. Others in the picture are Singapore chess officials. Good intentions and good results are two completely different things and in order for the former to graduate to the latter I have always believed in the virtue of listening. Many supporters encouraged me to put up a good contest but, on the other hand, several delegates advised me that I am going too fast, that the best strategy to ensure reform is first to seek some form of co-relationship with the incumbent leadership. After a great deal of thought and consultations with my team we decided that a more realistic way to go about this reform movement is to work from within the FIDE governing body. That way we do not have to go through the sterile process of never-ending debates and proxy counting that we have experienced in recent FIDE Congresses. The agreement we have signed is the best we could achieve at this time. We are confident we will thus be able to influence the right changes for FIDE. We will from now on dedicate all our time and energy to make FIDE better and more open. I appeal to supporters to continue to visit our website and to give us your opinions to help us further improve on achieving our goal for reform. In November, 2002 an election will be held for President of the World Chess Federation ("FIDE"). Here are photos of the candidates.